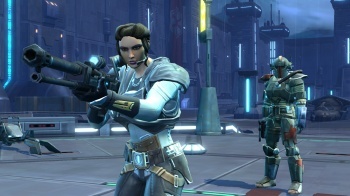 The studio calls the problems with the first Old Republic beta test a unique, one-off event. BioWare is giving all the beta testers for the first Star Wars: The Old Republic test weekend another chance to play the game. BioWare says that problems with invites and authentications had prevented many from getting adequate time with the game, and it wanted to rectify that. Writing on the BioWare forums, Stephen Reid said that although the studio had previous stated that people would only get invited to beta test weekends once, the situation was unique enough to warrant special measures. He said that BioWare was not changing its "one invite" policy on the beta test weekends, and that the second chance it was offering was a one-off. He asked for anyone who hadn't been invited to be patient, and said that BioWare planned to invite a lot of people before it was finished with testing. Reid also made it clear that it was not scheduling the replacement event for this weekend. He said that the latest build of the game was currently being tested internally, and that BioWare wasn't going to show it to the public until it was good and ready.